To stomach tube, use with a catheter tip syringe. For stomach tubing lambs and kids. The amount recommended for a newborn 10 lb lamb/kid is 4 oz 5 times a day if he is not being supplemented by mom. Red rubber tube - 16" long. Flexible rubber. Clear plastic - 16" long and Red plastic - 16.25" long. Easier to insert because they are less flexible than rubber. 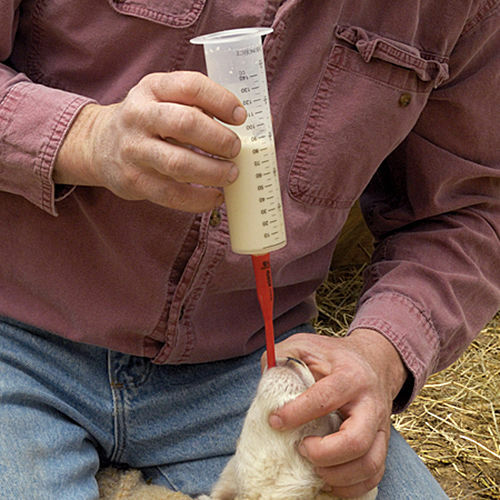 By using the following method you can feed both weak and stubborn lambs/kids quickly and safely. Be very careful to gently extend the animal's chin so that its neck is straight before carefully inserting the tube. If the light is good you can visually observe the bulge of the tube sliding down the neck. In bad light, we use our fingers to feel its presence. If you can neither feel nor see the tube, it may well be in the animal's hard hollow trachea and thus the lungs. Be cautious of this. If the tube enters the lungs instead of the stomach, pneumonia and starvation could result. Pull the tube out gently and restart it. The chance of wrongly inserting the tube is not as great as it may appear. Simply be sure that the tube is inserted in a straight line from the animal's mouth to its stomach. Continue to pass the tube into the stomach. The usual distance is 11 or 12 inches. You cannot pass the tube too far, but it is very important to pass the tube far enough. If it is in the correct position you will hear a gurgling sound through the empty syringe. Should the solution not run, the cause could be an airlock or possibly with older animals, the teeth could be clamped on the upper part of the tube. If an airlock occurs, slide tube in and out about 1/2 inch. Do not ram the milk into the stomach. 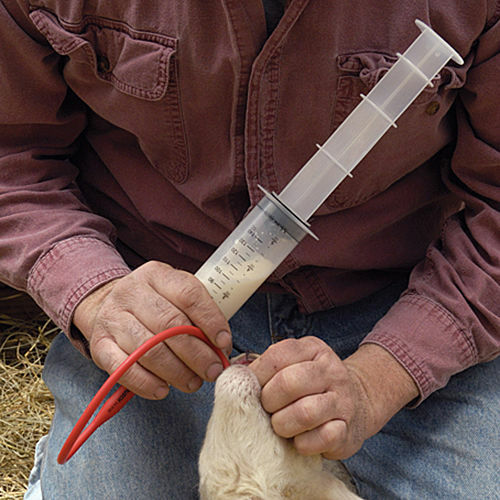 We usually do not actually insert the plunger unless using thick colostrum which will not flow on its own. If the plunger is used, gently push the milk into the animals stomach. On many farms during lambing time, one tube gets used over and over again without being cleaned or disinfected. Lambs that are being treated for scours or pneumonia should not be tube fed with a common tube. If you tube feed a sick lamb with a tube, wash it, disinfect it and let it dry before using it again. Keep plenty of tubes on hand. Be sure milk has had time to flow out of the entire length of tube and into the lamb's stomach before withdrawing tube from the animal. Doing otherwise may accidentally allow milk to enter the lamb's lungs as the tube is being removed. Red and Clear plastic tubes are a little easier to insert because they're less flexible. 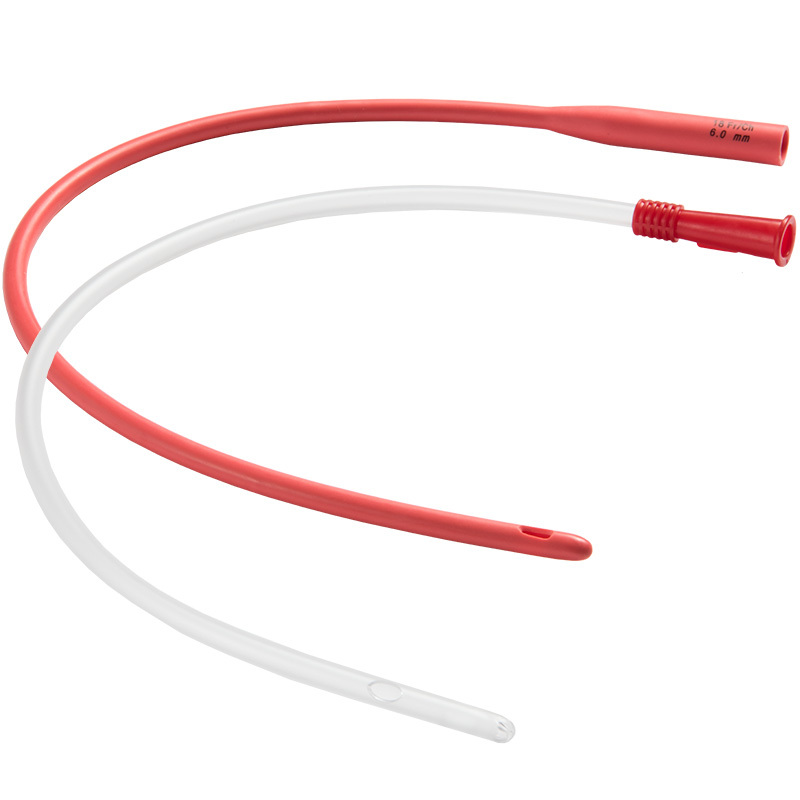 However, when it's cold (Midwest USA cold), red plastic tubes are stiff and may cause injury during insertion (a greater concern with goat kids). Red rubber tubes remain most flexible. 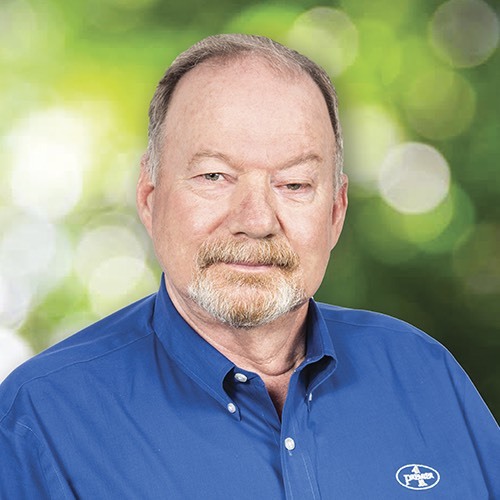 Number of reviews: 26 customers reviewed this product. Recommended: 24 out of 26 said they would recommend this product to a friend. I'd like to give this product a 5 because we have saved countless lambs with these tubes and large syringe. The only complaint is that sometimes they can pop off the syringe. Putting on clean is a must. I prefer the clear one because it is stiff enough to feed it down the lamb without supporting it with the other hand. They have to be put down the lamb slowly and you can't inject the lamb too fast. They buy time and get a lamb going when you have a lot of sheep to take care when lambing is at it's peak. For all the things a person buys to take care of sheep that are lambing, this is one of the most important things to have. I make sure I never find myself without having these on hand. Being a novice, I tried both tubes and I prefer the clear tube. It is easier to get into the lamb's stomach and the milk feeds into the stomach easier. The red tube, for me, seems to be easy for the lambs to pinch if they bite or start moving. The clear tube is more rigid but it softens quickly as soon as it warms in the lambs mouth. Also, it is easy to see the milk left in the tube when you are removing the tube, which makes it easier to assure the lamb doesn't aspirate the remaining milk. I use the soft red tube. It has made the difference between life an death numerous times. Sometimes one tubing to get colostrum into the stomach of a weak lamb is all it needs to get it on its fee and strong enough to nurse on its on. For others, it may take supplementation through the tube for several days to get it strong enough. Just in the last month, I had cases of both. I had one lamb who was big enough but a weak sucker. I tubed her once and it gave her the strength to nurse on her own with vigor. Then I had tiny twins born 3 and 4 pounds. The 3 pounder could not stand. Neither were strong enough to latch on and nurse with enough vigor. We milked the mother and tubed them for several days. Each day they were stronger and able to nurse a bit on their own, so that we only had to tube once a day. By day 5 they were totally independent and full of energy. Tubing is a little scary but with the good instructions available online, it is very doable. It's a life saver and better than a bottle when the lamb needs a quick start. Very easy to use. If you are unfamiliar with tube feeding please refer to a vet for guidance. I have both the red and clear tubes but the clear one is (in my opinion) better. I feel like I can really see that the milk has totally drained from the tube. Extremely fast shipping. Just in time for our kid goats to be born. Great item to have on hand. Thankfully didn't need to use it this time.